Many years ago, when I was in seminary, I had the unusual experience of living in two religious worlds simultaneously: one Christian and one Buddhist. In the mornings I would take classes on Christianity under the guidance of gifted seminary professors, all of whom were preparing me to become a minister. And then, in the afternoons, I would serve as the English teacher for a Zen Buddhist monk from Japan, who had recently completed his monastic training in Kyoto, having had the satori (enlightenment) experience with help from his Zen master. 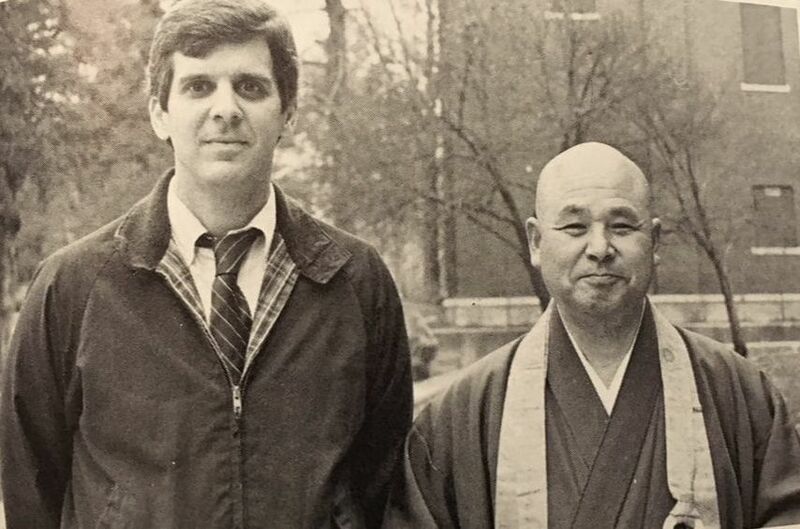 For a young seminarian fresh out of college, my year as an English teacher for this Zen monk – now my good friend - was a very intense year. I would leave morning classes thinking about the self's relation to God as understood in the Gospel of John, deeply steeped in the richness of a Christian path. Then I would visit with a Zen monk in the afternoon, talking about Zen, and wondering if the self and God even existed. He is pictured on the right. One day in seminary illustrates the whole year. I remember going to chapel in the morning, before class, and singing Amazing Grace along with my fellow seminarians. I felt enveloped in God’s love. That afternoon I then discussed with my Zen friend the meaning of the well-known koan "What is the sound of one hand clapping?" He explained that there is no rational or formulaic answer, but that there is an "answer" and that it has to do with not having a self separated from the world. He and I were always talking about the Buddhist idea of no-separate-self, or anatman. I left our discussion wondering if Jesus had a self in the first place, and if God had one as well. Maybe they, too, exemplifiedanatman. Maybe they could hear the sound of one hand clapping because their selves, like that of a good Zen Buddhist, were empty of substance and completed by the world. It seemed to me that the whole year was like this: trying to link the amazing grace of God’s love with the sound of one hand clapping. Of course this year did not emerge in a vacuum. For me, it emerged as the outcome of a rather deep search, not simply for Christian identity, but for a living Christian faith. I was myself surprised to find that Buddhism might help me find that faith. I had first become interested in Buddhism during my senior year in college. I was looking for an alternative to a form of fundamentalist Christianity into which I had briefly fallen; and I found that alternative in the writings of the late Catholic writer, Thomas Merton. You will see photos of him on the right. He was a monk living in a monastery in Gethsemane, Kentucky, who wrote voluminously on many topics, including war and peace, social justice, contemplative prayer, mysticism, and Buddhism. Merton’s interest in Buddhism struck a chord in me because I, like he, was drawn to forms of spirituality that emphasize "letting go of words" and "being aware in the present moment." Protestant Christianity often seemed too wordy to me. Buddhism pointed to a world beyond words. One reason I especially liked Merton was that he was sensitive to the fact that Christianity, too, points to a world beyond words. It points to the world of other living beings who are to be loved on their own terms and for their own sakes, who cannot be reduced to the names we attach to them; and it also points to the world of divine silence as experienced in the depths of contemplative prayer. Merton turned to Buddhism as a way of deepening his own understanding of the wordless, trans-theological dimensions of Christianity, and with his help I did the same. Under the influence of Merton's writings, then, I began to take courses in world religions during my first year in seminary, even as I also took course in biblical studies, the history of Christianity, and Christian theology. At this stage, my interest in Buddhism was satisfied primarily through books and lectures in these courses. Growing up in a middle-class Protestant setting in Texas, I had not really known a Buddhist, much less a Zen Buddhist, in a personal way. I had known cowboys. All this changed when I was asked by one of my professors to be the English teacher for the monk from Japan. My professor was a professor of world religions named Margaret Dornish, and I was taking a course on Buddhism under her. Her request, and my acceptance of it, changed my life. The monk’s name was Keido Fukushima, and he was being sent to the United States by his master in Japan to learn English and to learn about America. My assignment was to meet with him every day for one full year, teach him English, and also take him to numerous sites throughout southern California, from malls to monasteries. Indeed, I myself was to be part of the experience for him. In meeting me and getting to know how young people think, he would be meeting an "American." I tried my best to be an “American” for him, but I am sure that I was, at best, a middle-class Texan. I worried, along with Dr. Dornish, that I would be teaching Keido Fukushima to speak English with a Texas accent. I quickly learned that my student, whom I was told to call Gensho, had already had seven years of English as a student in Japan. I later learned that Gensho means young monk and that I was calling him "young monk" the whole time. This was odd, because he was ten years my senior, but it never seemed to bother him. In any case, he was being sent to the United States, not to learn English, but rather to brush up on English, so that he could return to Japan and field questions from Americans about Zen. Given his facility with the language, our agreement was that I would teach him English by having him explain Zen to me. Thus, we spent hours upon hours talking about Zen and Buddhism. As soon as we began talking about Zen, he explained to me that the best way to understand Zen is to undertake a daily practice of Zen meditation, or zazen. Under his guidance I did take up that practice, and I have been doing it ever sense. It introduced me to that world beyond words -- the world of pure listening -- that had led me to be interested in Zen in the first place. Twenty years of Zen meditation is at least part of the experience that I bring to this website. The other part is twenty years of teaching Buddhism and Asian religions to college undergraduates. But Gensho's explanations of Zen did not stop with discussions or with zazen. The wisest teachings he gave me in those days were the gleam in his eye, his ever-present sense of humor, and his kindness. These activities were for me then, and are for me now, living Zen. Dead Zen is what you get in books, and perhaps even books like this. Living Zen is what you get when you are face to face with a Zen person or, still more deeply, with life itself. As Gensho would often say, the ultimate koan is not the question: "What is the sound of one hand clapping?" It is life itself. It is how you respond to what presents itself: the birth of children, the death of loved ones, the caress of your beloved, the beauty of sunsets, the murder of innocents, the laughter of friends, the hunger of the child. When you respond with wisdom and compassion in the immediacy of the moment, you have become living Zen. Your life is your sermon. You are like the dog and cat in the photo: present in the present moment, true to your Buddha-nature in all its particularity. With his help, then, I came to realize that Zen is not about arriving at another place called nirvana, but rather about arriving at the place where we start -- namely the present moment -- and living freely in the here-and-now of daily life. Zen is among the most down to earth and concrete religions I know. It is very bodily and practical. For this reason I think Zen can enrich the incarnational emphasis of Christianity, which likewise finds the infinite in the finite, the sacred in the ordinary, the word in the enfleshedness of daily life. Living Zen can help Christians enter more deeply into that form of living to which we aspire: life in Christ. As I was spending my afternoons and many an evening with Gensho, my more conservative friends in seminary worried a little about me. They knew that Zen Buddhists do not often speak of God and that faith in God is not part of the Zen world. And they worried that I myself was falling into a dual religious identity. One of them called it "double religious belonging." I was not comfortable with this phrase. Even as I felt like I was experiencing two different worlds each day, I did not feel that I belonged to two countries and had two passports. Rather I felt like one person who was receiving nourishment from two intravenous tubes: one the dharma of Buddhism and the other the wisdom of Christ. I borrow this metaphor from a wonderful Zen teacher in the United States, Susan Jion Postal. Intuitively I knew the two medicines were compatible, but I was trying to figure out how they were compatible with my mind. Moreover, I knew that if I had to choose one medicine over another, I would choose Christ. I was not all Buddhist and all Christian, or half Buddhist and half Christian, but rather a Christian influenced by Buddhism. Fortunately, the two fluids did indeed feel compatible and mutually enriching, so I wasn't forced to choose. Each had a healing quality that could add to the other. What, then, was the healing quality of Christianity? Of course it has a lot to do with God and with the healing power of faith in God. Part of this healing quality can be described if I go into greater detail about the chapel service in seminary, when we sangAmazing Grace. When I sang along with the others, I felt that there was indeed a grace at hand, both in the lyrics and the melody and in the people singing it. We were somehow together in a communion of love, even as we were different persons. I sensed that there is a mysterious and encircling presence -- a sky-like mind -- in which we live and breathe and have our being, and that this mind is amazingly graceful. We can live from this grace and even add to it. For my part, I felt this grace most vividly, not in ideas learned from books, but in the gifts of personal relationships, in the beauty of the natural world, in the depths of dreams, in hopes for peace, in the silence of the soul, in the eyes of animals, in the mysteries of music, and in acts of lovingkindness. There is something beautiful in our world, even amid its tragedies. For me, this beauty is God. God is the lure toward beauty in the universe, plus more. And God is in the beauty, too. The beauty of the world is God's body. Admittedly, even in seminary, I did not always envision God as a male deity residing off the planet. Neither did my professors, especially those who were process theologians. With their help I arrived at a way of thinking about God that has made sense to me ever since. They helped me see that the universe is not outside God, like a servant seated far beneath a throne on which sits a king; but rather inside God, like developing embryos are inside a womb, or schools of fish are inside an ocean, or clouds are inside the sky. My professors called this perspective pan-en-theism: a phrase which was coined in the nineteenth century, and which literally means that everything-is-in-God even as God is more than everything. It seemed to me then and seems to me now that pan-en-theism is closer to the truth of amazing grace. Grace is not something we approach from afar, like a throne on which sits a king, but rather something that is "always already here" as pure gift. Just as the ocean is "always already here" for a fish swimming in it, so grace is "always already here" for human beings. Our task, as humans, is to awaken to what is always already here. I have said that from a pan-en-theistic perspective God is more than everything added together. This is certainly the case for process theologians. Just as an ocean is more than all the fish swimming in it, so God is more than our experience of God. Imagine a fish swimming off the coast of the Gulf of Mexico in North America, and imagining that he knew everything about the ocean, including what it is like off the coast of New Zealand and South Africa and the Arctic. This fish would be equating its own experience of God with the whole of God. Unfortunately, this is what I did during my senior year in college when I was a fundamentalist. I was pretty sure that I knew the whole of God and that others who disagreed with me were wrong. And this is why I am so glad to have discovered Thomas Merton, who helped me realize that the divine ocean is always more than our experience of it and we can lie back gently into its waters. From Merton I learned about God the more-ness, and about how silent listening was profound way to be connected with this God. Oftentimes in seminary before I went to sleep at night, I would pray to the divine more-ness. Not only the contemplative prayer that Thomas Merton describe, but also the more traditional prayer of address that is at the heart of so much lived religion. I would open my heart to the divine ocean and say “Please be with them O Lord” or "I am so sorry, God" or "Thank you, it is so beautiful" or "May all beings be happy." Indeed, in times of sadness, I would also pray the harder prayers, the lamentations and protests, such as "Why did you let this happen?" and "Where are you, anyway?" and "Why have you forsaken me?" These were for me a kind of primal speech of the heart, more like poetry than prose. They were reaching out into the vastness of a mystery beyond my imagination, yet present even in its absence. At first I felt a little guilty about these harder prayers. I knew that you find this kind of praying in the Bible quite often, in the Psalms for example, but for some reason I thought I was supposed to be nicer to God than the biblical authors. Thankfully, my professors explained that all these ways of praying are authentic if they come from the heart, because the divine ocean is big enough and powerful enough to receive and absorb all doubts, pains, sufferings and even all sins. How did they know this? Most of them appealed to experience and also to Jesus. In the minds of most of my teachers, Jesus was not a supernatural figure who descended to the earth from above, but rather a man among men whose opened heart revealed a special aspect of God: namely God's open-hearted reception of the world into the divine life, with a tender care that nothing be lost. If we imagine God as an ocean, they said, then let us imagine Jesus as a fish among fish, whose opened heart reveals the Empathy and Eros of ocean itself. Jesus was, as it were, a window to the divine. I liked to think of Jesus as one of those fish with especially shining eyes. You would look into his eyes and see the ocean. Its name was not power or control or fear. Its name was compassion. You could feel this ocean every time you listened to other fish and cared for them. You could feel it when you had compassion for yourself, too. It was a very wide ocean, without boundaries, and somehow people saw it in the eyes of Jesus. Not his alone, of course, but also in the eyes of others. Of course not all eyes reveal compassion. Some are all about power and control. People with power-hungry eyes have somehow lost sight of their capacities for vulnerable love. Their victims need our special love and care, and our hope that somehow the journey of live continues afterwards, so that their hearts find peace. And those with power-hungry eyes need our love, too. This is a teaching of Buddha and Jesus. We must not draw boundaries around love. I think that the ocean of compassion is also an ocean of listening. It is affected by everything that happens all the time: omni-vulnerable, like a man on a cross. I had a few friends in seminary, and I have many friends now, who do not believe in prayer. Some of my friends in the college where I teach don't believe there is a divine ocean in the first place. They believe that the great receptacle in which the universe unfolds is an empty space rather than an amazing grace, more like a vacuum than an opened heart. And, of course, they may be right. When it comes to the mystery within which we all swim like fish in the sea, we all see through a glass darkly. No one can grasp the ocean, not even Christians. Additionally, I have more religious friends who do indeed believe in a divine mystery of sorts, but who do not believe it receives prayers. They see the mystery more like an energy or force which can act upon things, but which cannot be acted upon. It has the power to give, but not to receive. Our task, they say, is to do the will of God, they say, cognizant that God does not need us in any way. For these friends, God is more like the male deity residing off the planet than an ocean of compassion. He stands above the earth, watching from time to time, and intervening from time to time, but he would do just fine if the earth and the whole universe ceased to exist. For my part, I have no objection to other people imagining God as a male deity residing off the planet. I think we need many different images of God in our imaginations, and that this image is one among many that can help us. I have met people whose lives have been empowered to deal with great suffering, with great courage, through this image of God. But I do indeed have a problem with people who imagine this male deity as having the power to give but not to receive; the power to issue commands but not to empathize; the power to act in the world, but not to be acted upon by the world. When God is imagined in this way, we have, as the philosopher Whitehead once put it, rendered unto God that which belongs to Caesar. I'm with Whitehead. A God who lacks the power to receive, who doesn't need the world in any way, is too monarchical. He is a lot like Caesar but not much like Christ. When I say "God" in this column I mean the Christ-like God as opposed to the Caesar-like God. I mean the God who is present to each living being on our planet and throughout the universe with a tender care that nothing be lost. I mean the God who is filled by the universe, just as an embryo fills a womb, or stars fill a dark and starlit sky, or fish fill the sea. I mean the God whose face is compassion not power, whose body is the world itself. I mean the God who is an ocean. The God whom Christians see revealed, but not exhausted, in the healing ministry of Jesus. Faith in God is trust in the availability of fresh possibilities. And life in God lies in being present to each situation in a kindly way, open to surprise, honest about suffering, and seeking wisdom for daily life. I saw this kind of faith in "Gensho." He did not have an image of God in whom he placed that faith. When God becomes an ocean, we must sit loose with images, too, lest we make idols of them. Still we can have faith in something more, maybe even someone more: someone who listens and seeks our well-being. This is a faith to which I am drawn, moment by moment, as I try to walk with Christ, with help from Zen. ​Can a Christian be a Buddhist, Too?